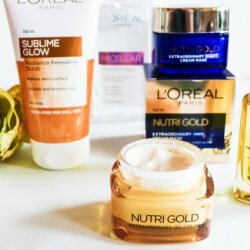 Win a "Nutri Gold Extraodinary Oil" kit from L'Oréal Paris! Do you know the feeling? 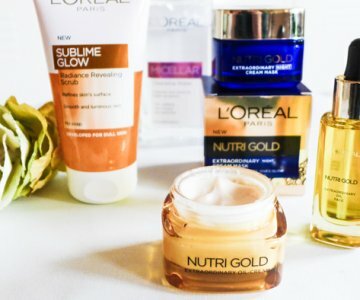 When you get an item in your wardrobe that you really fall for? That you wear almost everyday? That is so you? Well apparently, that is the relationsship I have now developped with this long blue coat from Minimum Fashion!. I wore it almost everyday in Berlin. It has this classic touch, the perfect cut, and the marine colour suits me so well. I can mix and match it with everything. Such an item to keep forever in my wardrobe. On there outfits, I have chosen to give it a street/arty twist that was perfect when walking down the streets of Berlin. I am by the way wearing my new little cross-shoulder bag from VRS Fashion (@vrsfashion), a quite new brand that you can find in Føtex & Bilka) – “very” good brand at “very” good prices! Kender du den følelse? Når du får et stk. tøj i din garderobe, som du virkelig falder for? Og du tager den på næsten hver dag? Noget der er så DIG? Jeg har nu udviklet denne salgs forhold til en lang blå uld frakke fra Minimum Fashion! Jeg havde det på næsten hver dag i Berlin. Frakken har en klassisk touch, et perfekt snit, og marine farven passer mig så godt. Jeg kan mikse og matche denne frakke med alt. Jeg tror, at jeg beholder den for evigt i min garderobe. I Berlin, har jeg valgt at give det en “cool”/ arty twist som passede perfekt til de lange ture i byen. Jeg er i øvrigt iført min nye lille cross-shoulder taske fra VRS Fashion (@vrsfashion), et helt nyt mærke, som du kan finde i Føtex & Bilka) – “Very” godt mærke med “Very” gode priser!